President Rodrigo Duterte delivers a speech before soldiers in Carmen, North Cotabato on June 6, 2017. 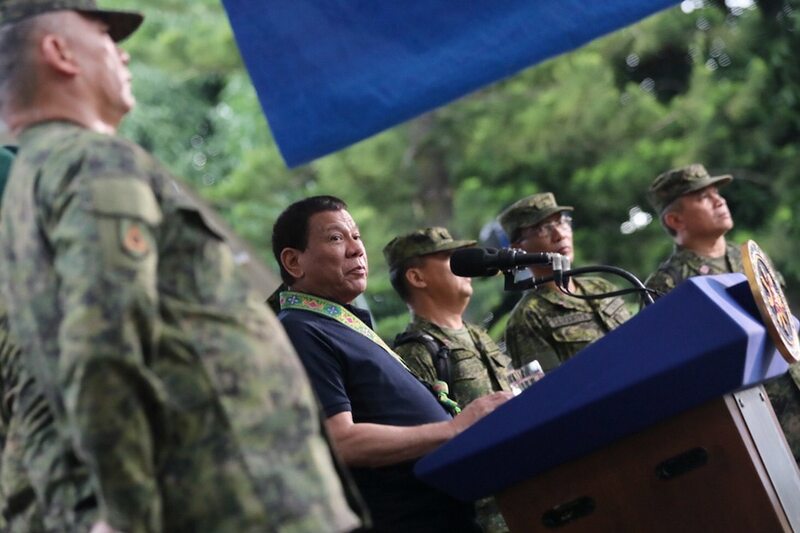 (UPDATE) President Rodrigo Duterte on Tuesday taunted the military to go to Senator Antonio Trillanes IV if they ever lose confidence in him as a leader. The President has repeatedly been saying that the military is free to oust him if they are no longer satisfied with his leadership. In a one-on-one interview with Chief Presidential Legal Counsel Salvador Panelo, the President said the military may even join Trillanes, his top critic who is a former Navy officer. "Kung kayo may nakita na ginawa si Trillanes para sa inyo, go to them. Stage a mutiny or revolution or whatever," he said. "You are free to do that. As a matter of fact, I’m encouraging you, para tapos na." Trillanes, meanwhile, said he is not competing with the President, who has "become so insecure." "Wala pong nakikipag-kumpetinsiya sa inyo. Siya po ang commander-in-chief ng Armed Forces. Ako po ay isang senador, tumutulong ako whenever I can, not only to soldiers and policemen but to everyone, lahat ng kababayan natin," he told reporters at the Senate. "Ganun din dapat siya, hindi kami nagpapataasan ng ihi dito. Walang kumpitensiya. I believe yung mga sundalo, maliwanag yan. They are loyal to the chain of command and the constitution. So I don’t know where this insecurity is coming from." The President also warned soldiers against being influenced by Magdalo forces, the group led by Trillanes which staged mutinies against the administration of former President Gloria Macapagal-Arroyo. "Ang sinasabi ko lang sa sundalo ng republika, just be careful na 'yung pagsabwatan niyo diyan sa Magdalo," he said. Duterte voided Trillanes' amnesty on August 31 and ordered the restoration of criminal and administrative charges against the lawmaker. His proclamation was made public on Tuesday last week. Trillanes argued he satisfied all the prerequisites of the amnesty, which was even concurred in by Congress. Trillanes was charged with coup d'etat before the Makati Regional Trial Court and violation of Articles of War 96 (conduct unbecoming an officer and a gentleman) and 97 (conduct prejudicial to good order and military discipline) before a military court. The cases stemmed from Trillanes' and the Magdalo band of junior military officers' takeover of the Oakwood luxury apartments in Makati City on 2003 and of the Manila Peninsula hotel in 2007. In both instances, the Magdalo protested alleged corruption under Arroyo. Trillanes won a seat in the Senate in 2007, campaigning from detention. He was reelected in 2013. In 2016, while running for vice president, he campaigned against then Davao City Mayor Duterte. He has since become Duterte's fiercest critic, calling on the chief executive to undergo drug tests, psychological assessments, and to bare his state of health and wealth. Since he arrived from a diplomatic trip from the Middle East, Duterte has been touting how he "doubled the salary" of the military. "I doubled the salary. I doubled it long before Marawi [siege]," the President said. Trillanes' camp over the weekend said the 4-tranche salary increase being enjoyed by soldiers was enacted into law during the Aquino administration after the signing of Executive Order 201. The EO also known as "Modifying the Salary Schedule for Civilian Government Personnel and Authorizing the Grant of Additional Benefits for both Civilian and Military and Uniformed Personnel," was signed by Aquino in February 2016. Under Aquino's Executive Order, the minimum salary for government workers was raised to P11,068 from P9,000 "to make it even more competitive with the market rates." "Our military and police personnel are aware that their allowances, together with the salaries of all government employees, have significantly increased since 2016, and will continue to increase until 2019," Trillanes told reporters. "This increase is actualized by EO 201 signed by the previous administration. President Duterte has nothing to do with this. His promise to double the salaries of soldiers and policemen remains an unfulfilled promise," he said.